There is an increasing need to harvest alternative energy, and offshore wind is a valuable potential resource. A prerequisite for development is to determine appropriate sites where the impact to natural habitats would be minimal. Prospective sites may be in outer continental shelf waters, where there has been limited or no research performed in the past due to difficulties in reaching these distant locations as well as associated high costs. In late 2010 the Department of Interior's Bureau of Offshore Energy Management, Regulation and Enforcement (BOEMRE) issued a Request for Interest (RFI) for commercial wind energy development in outer continental shelf waters off Massachusetts. The area south of Nantucket and Martha's Vineyard was originally 3,000 square miles, but was reduced to about half that size in response to the Commonwealth's recommendations representing the fishing industry. Massachusetts Clean Energy Center (MassCEC) in partnership with the state's Executive Office of Energy and Environmental Affairs (EEA) issued a Request for Proposals (RFP) to perform surveys in the RFI area. The 18-month contract was awarded to the New England Aquarium for marine resource characterization surveys of sea turtles, right whales and other large whales. MassCEC requires a year's worth of seasonal migratory data to inform the federal leasing process. 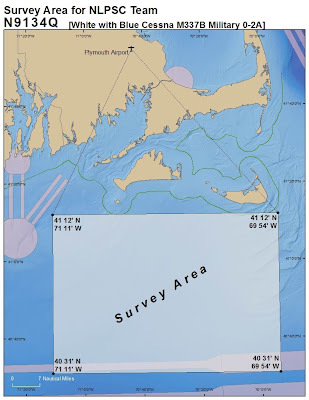 The Aquarium collaborated with other prestigious New England research groups in order to fulfill survey objectives, forming the Northeast Large Pelagics Survey Collaborative (NLPSC). University of Rhode Island, current curators of the right whale sightings database, will be involved in data collection methodology, density and distribution analyses and data quality control. 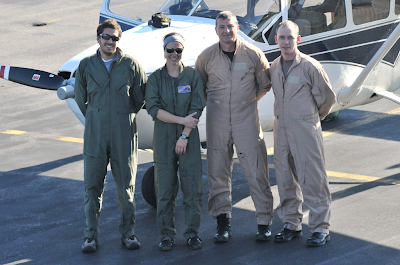 Two experienced aerial observers / photographers on each survey flight are from Provincetown Center for Coastal Studies (PCCS) and the Aquarium. The two pilots from ASSIST-U.S. also have a background in aerial surveillance. The goal is to perform two aerial surveys per month with additional surveys in response to biological hotspots or areas of particular interest. The Bioacoustic Research Program (BRP) at Cornell University deployed six BRP-developed Marine Autonomous Recording Units (called "pop-ups") in a configuration to detect whales within and around the survey area. Automated data recognition and expert human validation detect vocalizations of blue, fin, right, humpback and minke whales. All five species are known to occur near the survey area and are readily identifiable by their species-specific vocalizations. The survey aircraft is a Cessna O-2A, the military version of the C-337 (see image). Two observers in the rear seats scan for large whales, while the automated digital SLR camera mounted over optical glass in the belly port of the plane collects vertical photographic data at 5-second intervals for turtles on the tracklines. Aerial Imaging Solutions (AIS) developed and customized the camera mount system and data logging program. It enables us to acquire high quality images that compensate for the plane's forward motion, while we remotely operate the camera from our laptop. Each georeferenced image also has details of associated flight parameters such as altitude and speed. Through the Aquarium's involvement in this project, we have developed a skilled aerial survey team with cutting edge technology to obtain high quality, reliable data. Consistent aerial surveys to retrieve valuable environmental data where historical survey data has been spatially and temporally inconsistent will help advancements towards assessing seasonal migration and habitat use in this region. We are proud to be an integral part of this collaborative effort in the contribution to informed decisions for offshore renewable energy development.